We’ve recenlty taken stock of the most popular lines of equipment from Hayabusa. 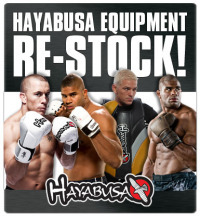 With a full restock on everything from the Kanpeki Elite 2.0 Series, Tokushu, Ikusa and Pro Training Series equipment ranges, all of your favourite Hayabusa MMA Gloves, Hayabusa Bag and Sparring Gloves and much more are now back in stock! To check out whats back in stock in the range of Hayabusa Bag Gloves and Hayabusa Sparring Gloves; check out ourAi? ?Hayabusa Boxing GlovesAi? ?page on our site. For an overview of the Hayabusa Body Protectors and Hayabusa Pads back in stock, check out ourAi? ?Hayabusa Training EquipmentAi??page. Check out theAi? ?Hayabusa MMA Gloves,Ai? ?Hayabusa Head GuardsAi??andAi? ?Hayabusa Shin GuardsAi? ?also now back in, from the above mentioned equipment ranges. This entry was posted in News and tagged Hayabusa, Hayabusa Fightwear, Hayabusa Restock, MMA on 17.10.2013 by .